Just a quick update to share the above, a near final version of the game ready for Dragonmeet tomorrow. It still needs a final round of proofing but otherwise it’s done. Finished. Next up: Getting the file ready for submission to DrivethruRPG and a bit of promotion. 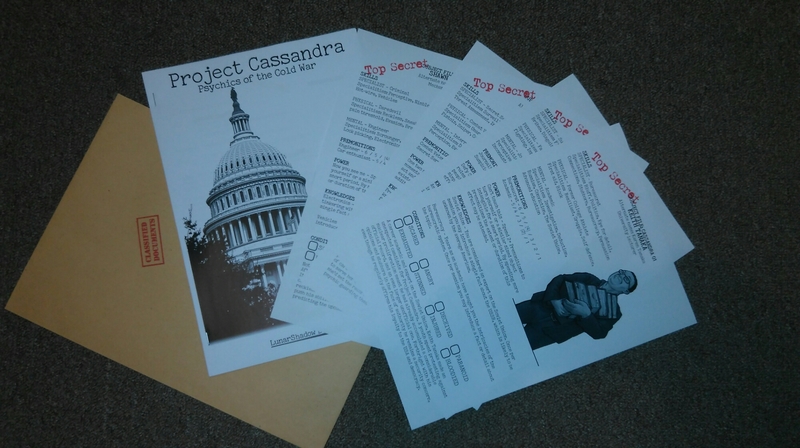 ​November is fast approaching and along with it my target deadline of finishing Project Cassandra by the time if the US presidential elections. That’s not likely to happen now, mostly as I want to reorder a couple of sections and expand on some others. On the plus side I think I now have all the artwork that I want to use so the new aim is for the start of December, just in time for Dragonmeet in London. One of the sections that I’ve decided to add is a small example of play, the first draft of which is included below. I’ve tried to highlight the basics without going too long or too detailed though it still needs a bit of work. The following gives an example of play. Dahlia Sarsin (played by Kate) and Keith Tanaka (played by Richard) are just leaving a small diner off of the highway, having convinced the Russian defector Sergi that they mean him no harm. Sam, the GM frames the scene. Sam: You know trouble is brewing the moment you step out of the diner, there’s a man in a gray suit waiting for you by your car. He motions to you, his intent clear: Step this way. What do you do? Richard: I’m unarmed so I nod and slowly start walking forwards, trying to get a parked car between us. Kate: This is too simple, something’s wrong. I take a proper look around the lot to get a feel for the situation. Sam: Think that’ll need a roll, with a difficulty of 4. Kate: Ok, I’m using my Secret Service skill group and have surveillance, security and threat assessment which gives me a skill level of 3. [Rolls] Damn, only 2 successes. I’ll spend a premonition to reroll it. [Rolls] Not much better, 3 successes and I think I need to save my premonitions for now. Oh, I’ll tag Angry and raise it to 4, I should have seen an ambush like this coming. Sam: Ok. You spot her at the last moment, lying on the roof of a truck with a rifle. Her first shot whips past your shoulder, next to you Sergi freezes in panic. Tanaka – you’re almost at the car when you hear the gunshot, do you keep walking forward? Richard: No, I’m going to dive into cover then I want to spend premonitions to make Sergi intangible before he gets himself killed. Sarsin should be able to look after herself for now. Sam: The car just in front of you will provide cover but you’re having to react pretty quickly to all this… lets make it 3 premonitions to activate your power in time. Richard: Ok, so as the would be assassin makes her next shot Sergi turns slightly translucent and the bullets whiz through him, shattering the glass of the door to the diner. Screams erupt from inside. Sam: I like it. In the commotion the two men by your car duck into cover, drawing pistols as they do so. What do you want to do next? Kate, looking at her knowledges: This is a truck stop right? I know all about weapons, including that the sort of person who drives that 18 wheeler in the corner is going to have a shotgun in the cab. I make a run for it, cover be damned. Been a while since I’ve posted much, mostly due to a lack of gaming but wanted to share this blurb for an upcoming online game I’ll be running on G+ (yes it still exists). Leave a comment or find me on G+ if you’re interested in playing. Long ago, a wise and mighty tribe left their dying home in search of new lands to settle. They wandered for many years with their great machines carrying then far into the darkness before tragedy befell them and a great plague decimated their numbers. Those that survived found themselves trapped in this great valley we now call home and the Com, the wisest amongst them, declared that the one great tribe should become the many that now inhabit the valley. In the many years since we may have lost the ancient knowledge but our people, the Children of the Com, remains respected for its wisdom and fair judgement. Now, young ones, it is time for you to claim your place as adults amongst our people. You must travel to Warden Isle and the Library of Souls. There you will receive the Blessings of the Ancestors and your place in our world will be revealed. To protect and guide you the Com gifts you these wonders from the before. Use them wisely, for many in the wilderness would seek their power.